xiphmont | Microscope! So why an SZH? I actually like my AmScope. It's not exactly precision-manufacture and god only knows what glass it uses, but it's durably made, fairly ergonomic, and works well for the price. Only one regret: The camera port is damned near useless. For some reason, Chinese stereo scopes mostly appear to be clones of old, low- and mid-range Olympus designs. That planted the Olympus bee in my bonnet. You've probably heard that Nikon is a world-class optics manufacturer that just happens to make cameras. Well, Olympus is a world-class optics manufacturer that just happens to make microscopes. Looking for no-holds-barred top shelf stereo optics, the current top of the Olympus stereo line is the SZX12. Which is awesome and even broken surplus parts are so far out of budget it's not funny. Mostly the same for the SZX10, its slightly less featureful little brother. But it turns out the very top of the discontinued predecessor line, the SZH10, is similar enough that it takes many of the same accessories and was every bit as good a scope. And the SZH10 was just a minor feature tweak of the earlier SZH. And the SZH line is so gloriously 1980s. I mean, just look at this ad. It's not a stereo zoom. 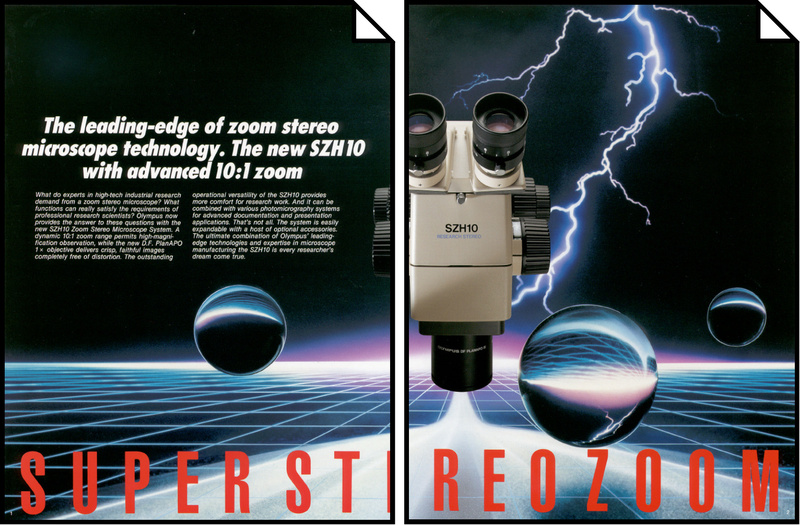 No, it's a *super* stereo zoom. And raytracing is involved somehow. And lightning. This here 'scope is obviously real wrath-of-god stuff. Anyway, the rest is serendipity: There just happened to be enough cheap-ish parts on eBay to hopefully piece together a complete SZH with no major flaws.